They are finally finished! I probably should have written this when I actually completed the Celtic Knot Number Tiles back at the end of 2015, but things tend to get away from me fairly quickly. 4 to 6 months isn’t too much of a lag time to get a post out, right? 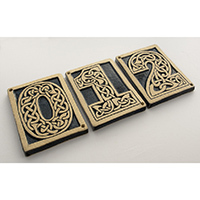 The Celtic Knot House Numbers are actually an extension of my Celtic Knot Alphabet Tiles, which I first had for sale almost 3 years ago at this point (and now the requisite “Oh, how time flies” statement). 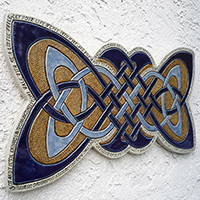 With no beginning or end, the knot in Celtic art symbolizes interconnectedness and eternity. 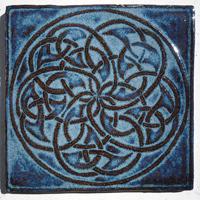 The Endless Knot Plaque's original design features two intertwined knots of light and dark blue weaving together into a whole. A poem etched into the plaque (written out below) frames the knots and speaks to their union. Perhaps representing two loved ones, their lives as joined as the knots, this wall hanging is perfect for a wedding or anniversary. Earth and Sky; Sun and Soil. 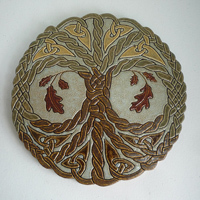 The hand-carved Celtic Knot Oak Tree plaque entwines branches and roots in an endless dance, weaving above and below. 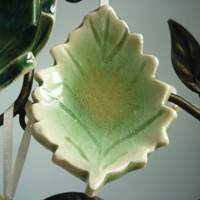 The Celtic Knot Oak Tree is my original design, though it plays off the traditional Tree of Life motif. 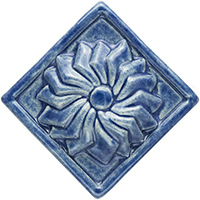 With no beginning or end, the knot in Celtic art symbolizes interconnectedness and eternity, and the oak symbolizes strength, wisdom and nobility. I have been traveling a lot this past month, driving around the eastern US, from Pennsylvania to West Virginia, Tennessee, Michigan. While driving long distances is definitely not one of my favorite pastimes, it has given me an opportunity to observe the gorgeously vibrant colors of the changing leaves. It really is a lovely time for a road trip, and the varying hues of the forest-clad hills have inspired me (see some of my inspirations here)! Unfortunately, I have to face the fact that it is now fall. With glorious sunny days and temperatures in the 80s this past week, I can almost pretend August lingers still and chill and frost are far distant. 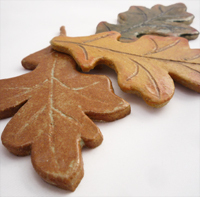 But October descends upon us (already!) and summer just teases; she has flown south already, and it is time to start planning for the winter. Ugh, I really do not like the cold! I didn’t – quit my job, that is. Sorry to ruin the suspense, but as of this posting I am still employed (albeit part-time) by an absolutely wonderful environmental consulting firm in New Jersey. And this, I have to admit, is a really good thing, because even though environmental consulting is no longer my chosen career path (crossing my fingers), the job pays the bills and funds my “hobby” until my business actually becomes profitable.